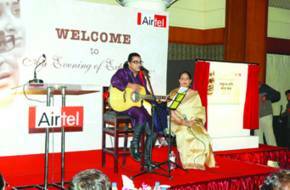 Bharti Airtel, India’s leading mobile service provider, had sponsored the release of Mayukh’s maiden album ‘Sokue Jodi Kotha Koy’ at a star studded function in the city where the doyen of Assamese music, Dr Bhupen Hazarika was present. 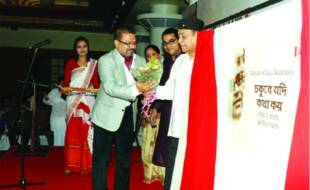 “An Evening of Expression” was an intimate one with the Hazarika family - Bhupen Hazarika, Mayukh Hazarika and Laili Hazarika along with noted filmmaker Kalpana Lajmi and the elite of Assamese film industry and society such as J.P. Das, Anuradha Sarma Pujari, Mridula Barua, Manjula Hazarika, Saradi Saikia, Malaya Goswami Apurba Bezbaruah, Kapil Bora and Wasbir Hussain among others present graced the occasion. 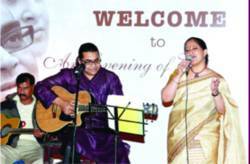 The whole environment was very nostalgic, and Mayukh and Laili mesmerized the audience with their superb renditions of some of their own compositions. Sudipto Chowdhury, Chief Operating Officer, Bharti Airtel NESA felicitated Dr Bhupen Hazarika with a phulam gamoosa and an Endi shawl and said, “Bharti Airtel is providing world class mobile phone service to its customers in Assam and North East. But what humbles us is our efforts towards giving back to our society through the promotion of art, culture, sports and literature in a big way. All through the years of our operations in the State, we have supported the mobile theatre movement in Assam; worked for promotion of cricket, football and adventure sports; stood by the side of the organisers of stage plays, music and dance festivals in different parts of the region. Once more Airtel is delighted to promote two of the most promising artistes of Assam, Mayukh and Laili Hazarika. We are confident that they will be role models for the aspiring young singers of the State.